For truly delicate and fine processing tasks (mastering etc.) Elixir presents a new innovative concept called Stages, providing the option to set the algorithm to perform the limiting processing in multi-stages, in order to achieve even more precise and natural sounding results. The algorithm uses an oversampled representation of the audio sample as reference when defining the gain envelope, while the actual processing is applied only to the original none oversampled data, in order to reduce artefacts (like aliasing) and to achieve the most precise and excellent sounding result presenting none, or effectively reduced, conventional limiting pumping effects even during heavy processing. In addition to Stages, Elixir present the option to run the algorithm in a higher resolution mode with even more detail put into the processing, obviously, at the cost of additional CPU-consumption. 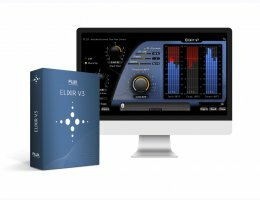 Elixir v3 is available in AU / VST / AAX Native / AAX DSP / AAX AudioSuite / Waves SoundGrid.